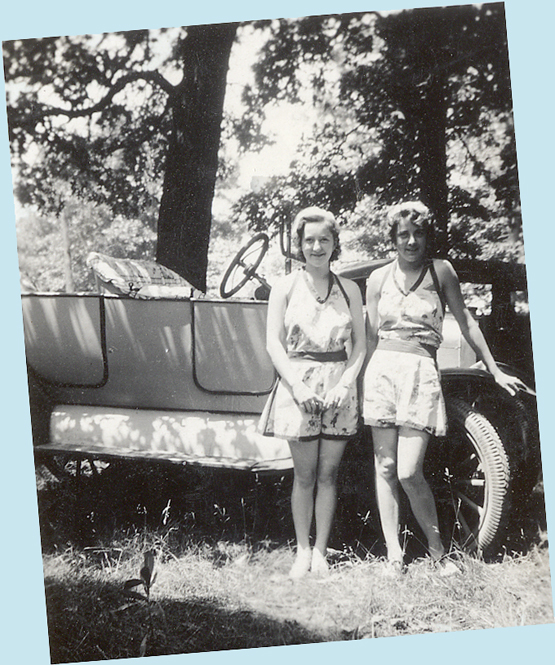 This is from one of Mom’s first visit to the Claycomb farm in Wayne, Nebraska, probably 1935 or so. John Claycomb, Barbara Claycomb, Richard Claycomb, Harriet Duncan, Frank Claycomb, and George Claycomb. Have to say, I just don’t recognize George – I put his name by elimination. 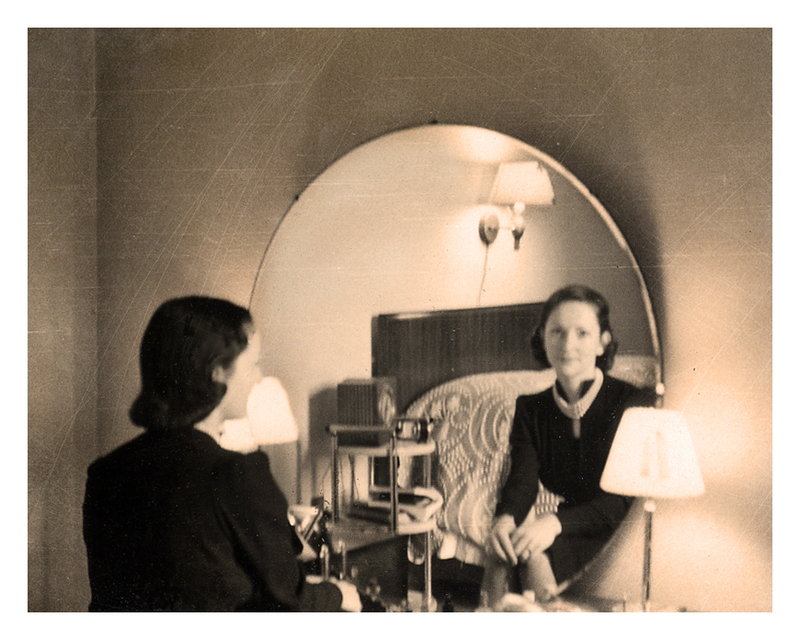 This is my mother, Harriet Duncan, about 1935. 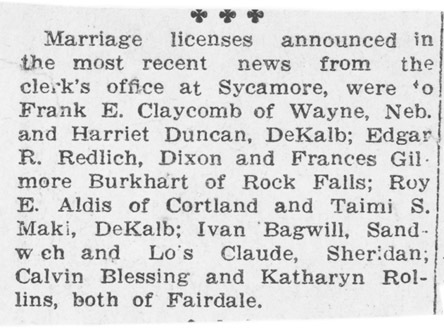 She was dating my father and they married in 1936. This is my Mom’s 4th grade class in DeKalb, Illinois about 1923. She is on the far left. 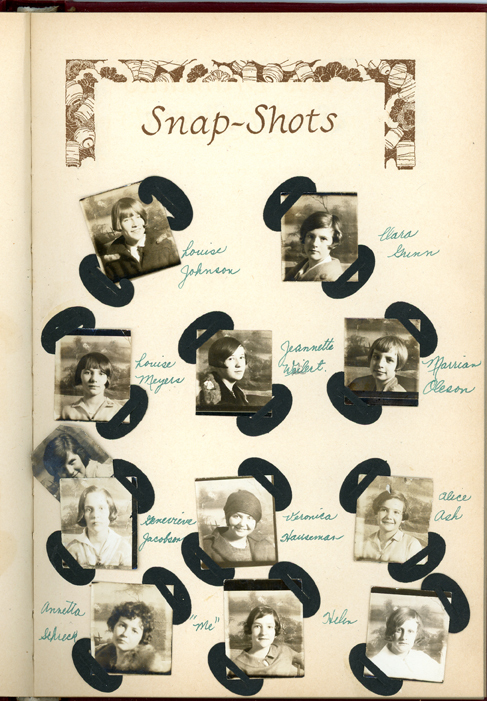 Left row: Harriet Duncan, Ruth Gustafson, Elvin Carlson, ___, Ethel Shattuck (teacher). 2nd row from left: Roland Ritzman, Hypatia Mordoff, Alice __, Harold Anderson, Charles Wedburg. 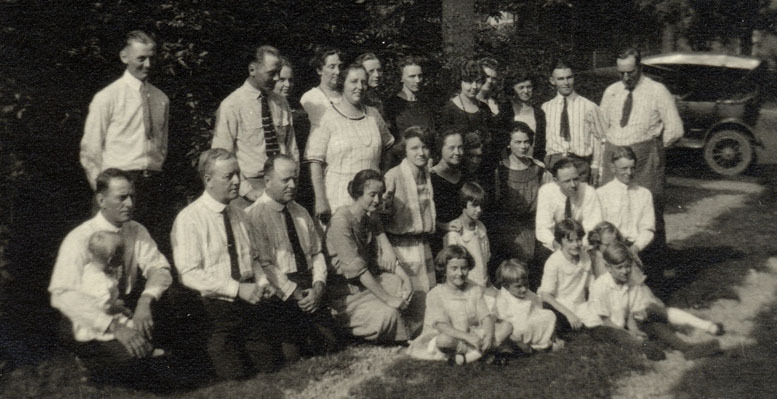 5th row from left: Etola ___, Harry Johnson, Miriam Blomquist, Edith White. Student teachers at the back. This is the eulogy we wrote for Mom’s memorial service in April 2001. Today is her 100th birthday. 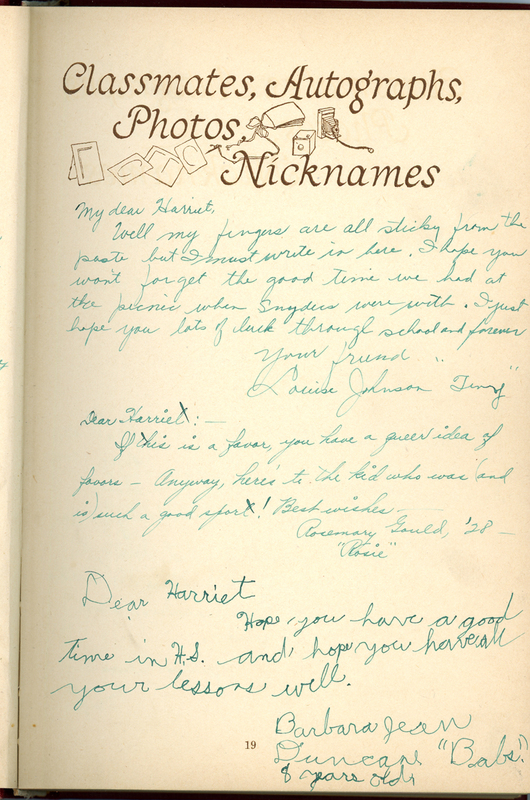 Harriet Lorraine Duncan was born December 2, 1914, in DeKalb, Illinois. She had an older sister Helen and a younger sister Barbara. Her parents were Roy and Albie Duncan and they provided the girls with a delightful childhood of picnics, church socials, ice skating parties and trips to Lake Geneva in Wisconsin. 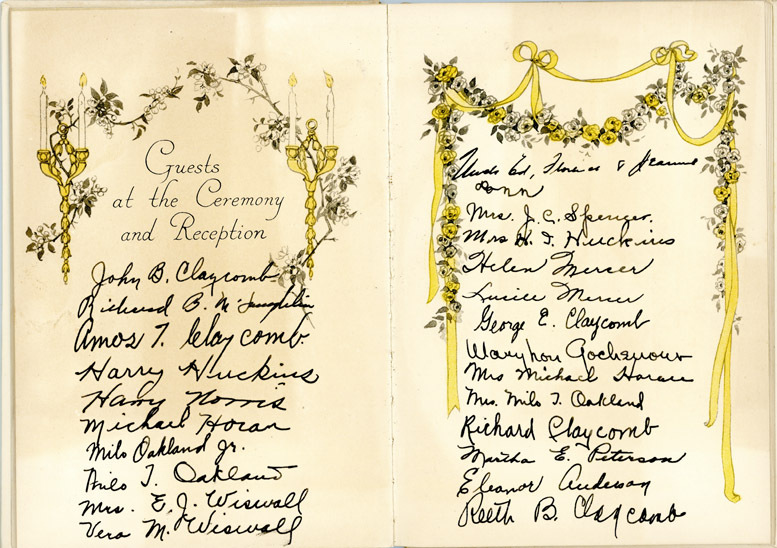 Her grandparents, aunts, uncles and cousins all lived within the DeKalb area and family gatherings and reunions were standard fare for holidays. She continued this tradition throughout her life. Her mother died when she was 12 and Harriet was raised by her grandmother until her father remarried. 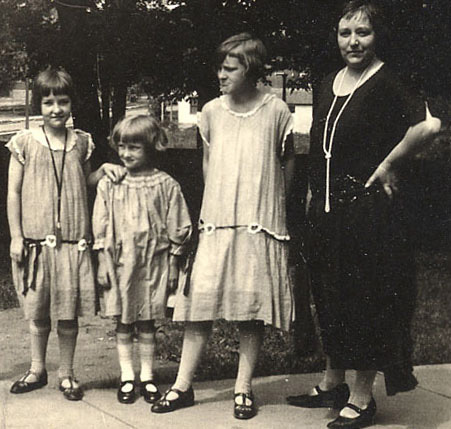 Harriet, Barbara, Helen, and their mother, Albie Duncan. 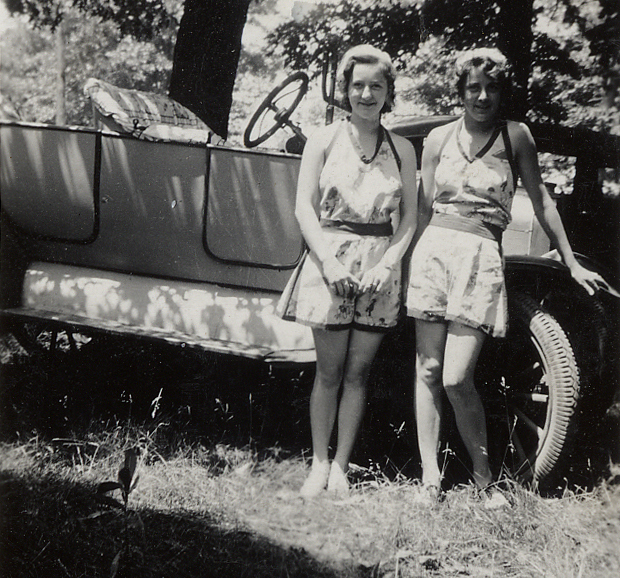 Harriet Duncan and best friend Fran Duffey, 1931. High school was followed by two years at Northern Illinois State Teachers College – now known as Northern Illinois University. A spirit of adventure and a taste for seeing other people and places was strong at this time. She and several friends took road trips to Chicago, Wisconsin, Kentucky and far away New England. 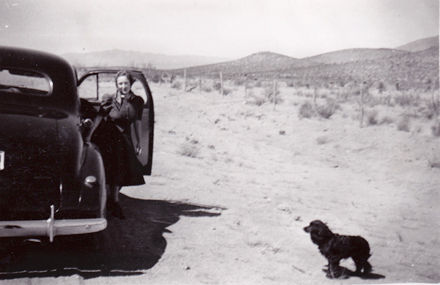 Harriet Claycomb on way to California 1939. 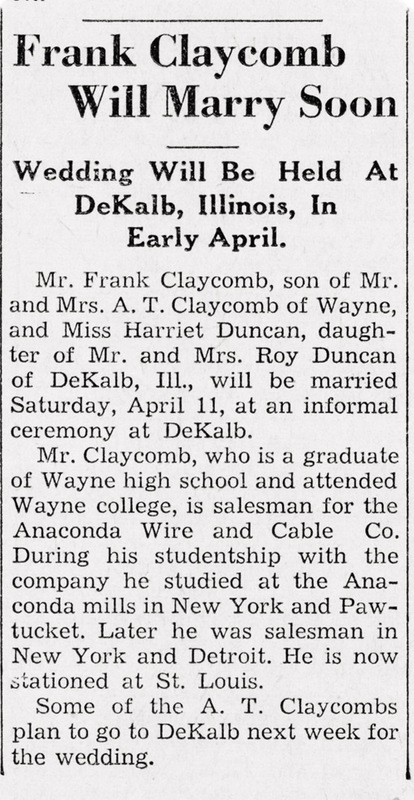 Her first job was in the office of the Central Illinois Power and Light Company and it was there that she met the young Frank Claycomb. 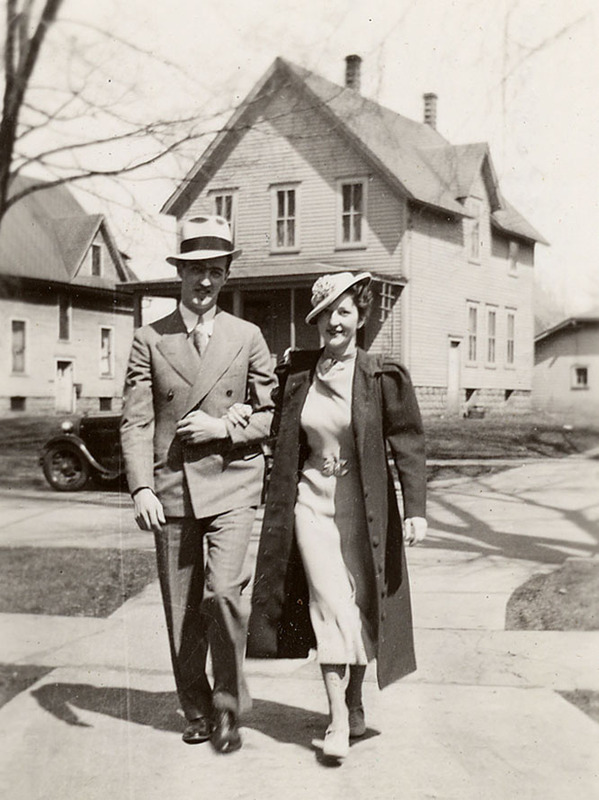 Harriet’s urban upbringing was in contrast to Frank’s farm background – but Cupid doesn’t make decisions based on logic and the two were married on April 11, 1936 in the DeKalb home of her father. Frank’s career in the electrical industry took them to homes in St. Louis, Detroit, and then west to Beverly Hills and Pasadena. Harriet admitted that she secretly cried when their 1938 Ford crossed the desert – wondering how she would survive in this obviously desolate country far from the lush green beauty of the Midwest. In behavior that was her trademark, she looked for and soon found the beauty of our southern California and eagerly took short trips to our mountains and, yes, to the desert too. Their first two children, Jeanie followed by Tom, were born in Hollywood Hospital. Their third child, Donna, was born five years later in San Diego at Mercy Hospital. All five of Harriet’s grandchildren are here today along with three of her five great-grandchildren. Another career move brought them to San Diego in 1945 and then in 1946 to a five-acre ranch in Eucalyptus Hills when the country life called again to Frank. Lakeside in the late 40’s and early 50’s was rural and remote when compared to today. Harriet, like most others then, washed clothes in a wringer washer and hung them to dry outside. She learned to can fruit and vegetables grown in the garden, packaged meat from the chickens, turkeys, cattle and pigs raised on the ranch – and at least once rendered the lard. She made jams and jellies from figs, peaches and apricots. The messiest to make and the best to eat was the pomegranate jelly. She learned how to feed the animals, move the sprinklers, and even learned Spanish to speak with workers. 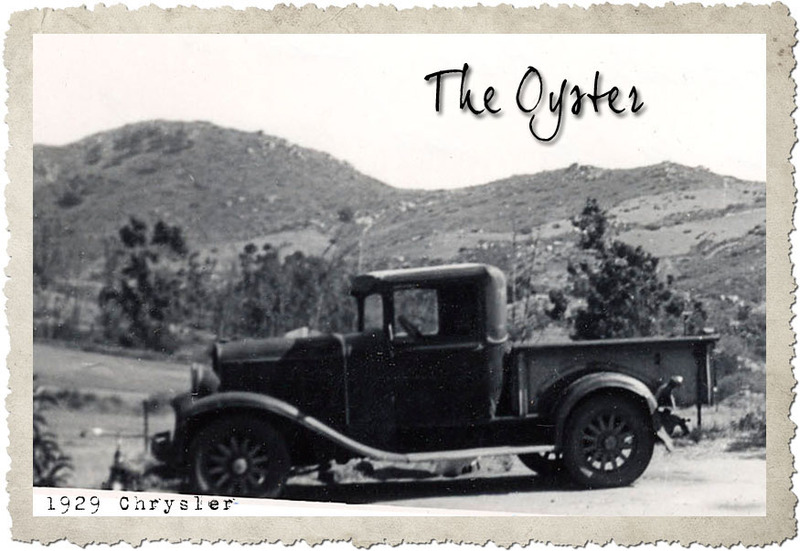 But the remoteness of Lakeside was lessened when Harriet got her first car – really a truck, a 1929 Studebaker that was named the Oyster. 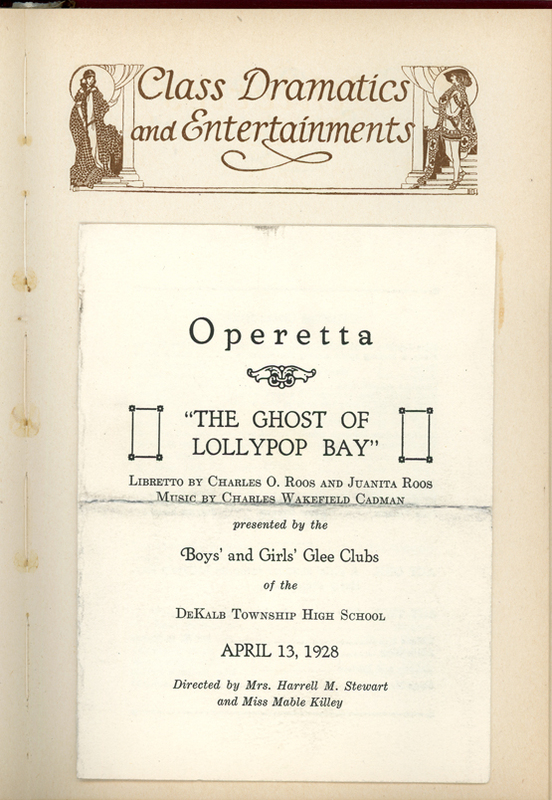 It wasn’t suitable for any road trips to New England, but it found its way many times to Lakeside Union Grammar School, the Lakeside Theatre, Little League games, meetings for cub scouts, brownies, then boy scouts and girl scouts. She once used the Oyster to haul a lamb to Mrs. Lyons Kindergarten class for ‘sharing period.’ Regular trips also went to Barker’s market, Watkin’s Bakery, Minchow’s service station and to the Presbyterian Church. Once all the children were in school, Harriet went back to work part time. 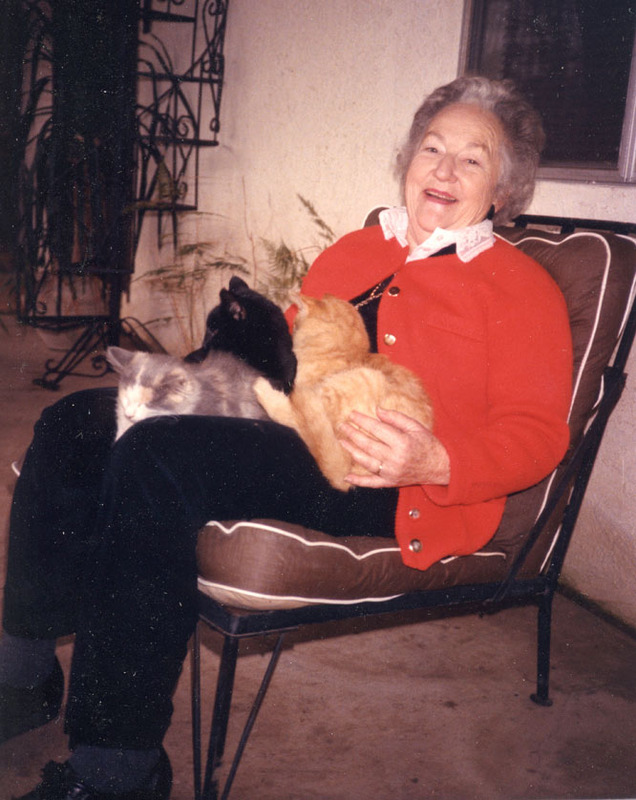 She enjoyed her years as a secretary for the Mother Goose Association, the Rios Canyon School, and later with the SDSU Astronomy Department. She occasionally sold Tupperware, Avon cosmetics, and jewelry at parties held at customers’ homes. Somehow she found time to paint, in oils and watercolors. Not many of you knew that she wrote and published short stories and poetry – not unless you read “Modern Romance” magazines during the 50’s and recognized her pen name, “Harriet Lorraine.” She joined Toastmistresses to learn public speaking. Harriet volunteered for the PTA, the Grossmont Hospital Pink Ladies, and visited local convalescent homes to visit with patients. Not surprisingly, when it came her time to live in an assisted living environment, the first thing she wanted to do was learn the names of all the residents. She was a positive, enthusiastic person who was eager to travel and always open to learning. In fact, she never stopped learning. She took adult ed classes, computer classes; Elderhostel trips to study history, birds of prey and geology. She studied to become a docent at the Natural History Museum in San Diego. During her work with the Astronomy Department she volunteered for field trips and studied maps of the sky to learn the names of constellations. 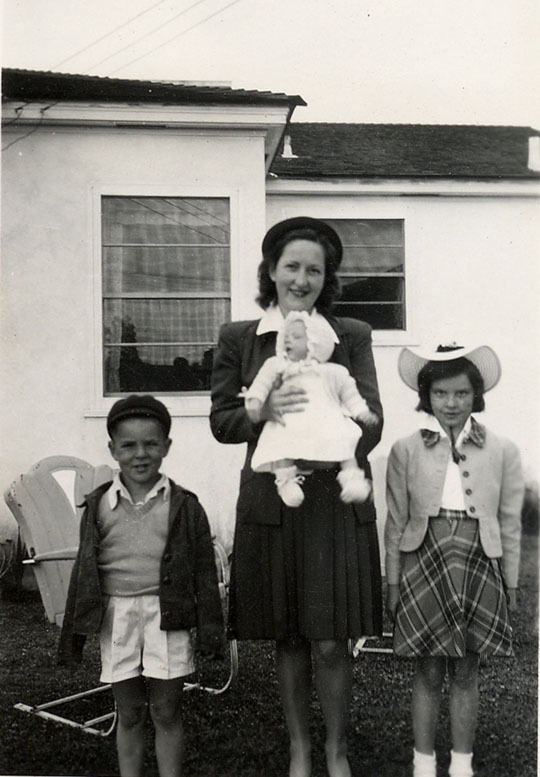 She traveled much of the United States during her 86 years and especially enjoyed three weeks in Africa visiting Donna. 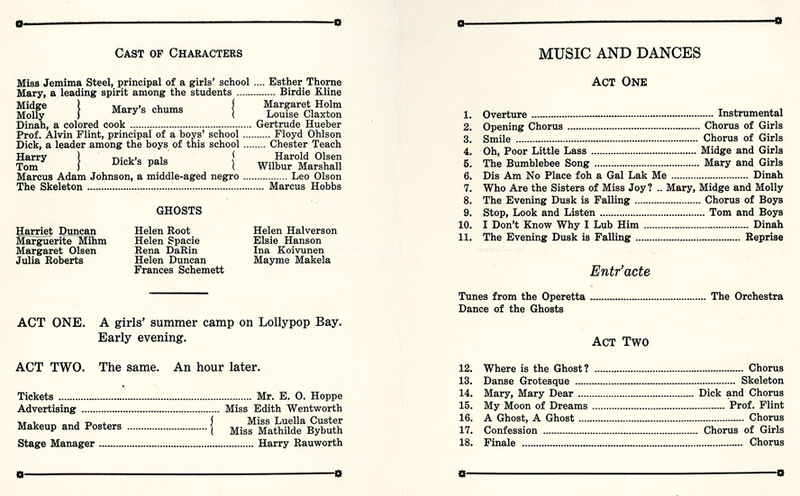 Harriet loved movies, plays, concerts and she read voraciously. Many of you here today have traded books with her. Perhaps the only thing she always wanted to do but didn’t get done was to learn to fly an airplane – something she wanted ever since seeing the barnstormers perform when she was young. She was a mother who truly enjoyed doing things with her children. Together they baked cookies, pies, cakes and candies. Neighborhood children joined in taffy pulls. She planned birthday parties with themes. She encouraged numerous high school slumber parties in her home. When the family camped in the Sierras, she cooked over a campfire. She was willing to try anything the family wanted to do. She went deep-sea fishing with Tom and caught a 20-pound yellowtail. A brief try at horseback riding with Donna ended only after a broken collarbone. She made certain her children’s education included plays, dance lessons and music lessons. She was the family anchor for holiday gatherings. Harriet Claycomb, Thelma Humphries, Jim Humphries, Jean Crews, Jerry Crews. Lakeside, California. Harriet and Frank often went square dancing with the Eickhoffs and Buckelews. Harriet made the skirts and blouses she wore dancing. 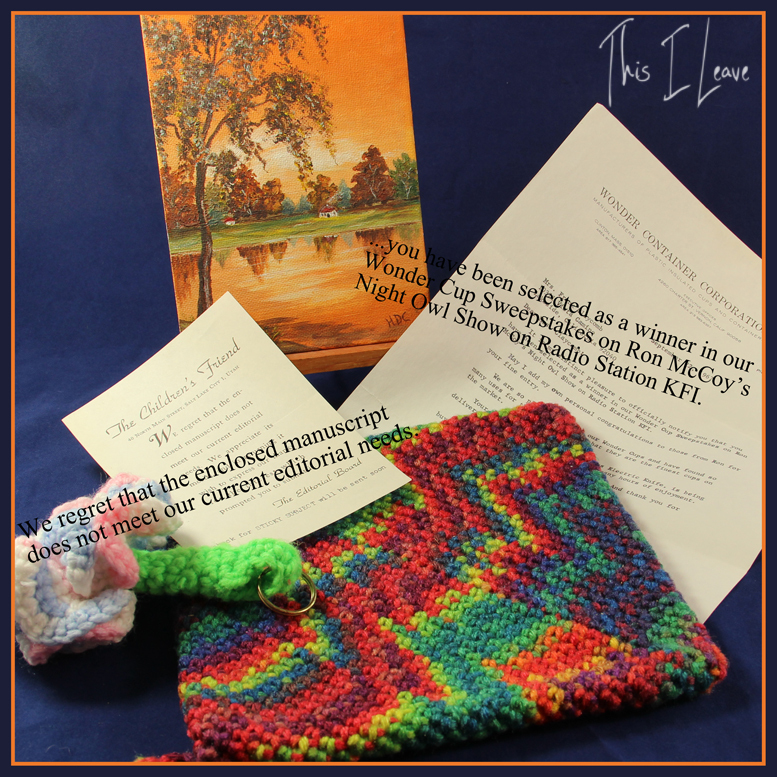 She also crocheted afghans, key-chains, and potholders by the hundreds. Harriet loved to swim and especially enjoyed the beach. Harriet and Frank would travel with the Humphries on trips strictly limited to funds gathered from penny and nickel bets on their card games. 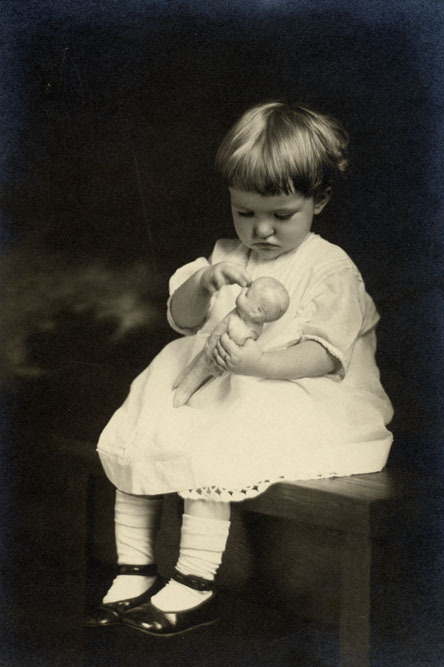 She played bridge, canasta, charades and a great game of “Go” and “Hand and Foot.” She often won, leading to her oft heard statement, “I was born lucky.” If an event had door prizes – she would invariably win one. She won the family’s first color TV set in a contest at a local grocery store. 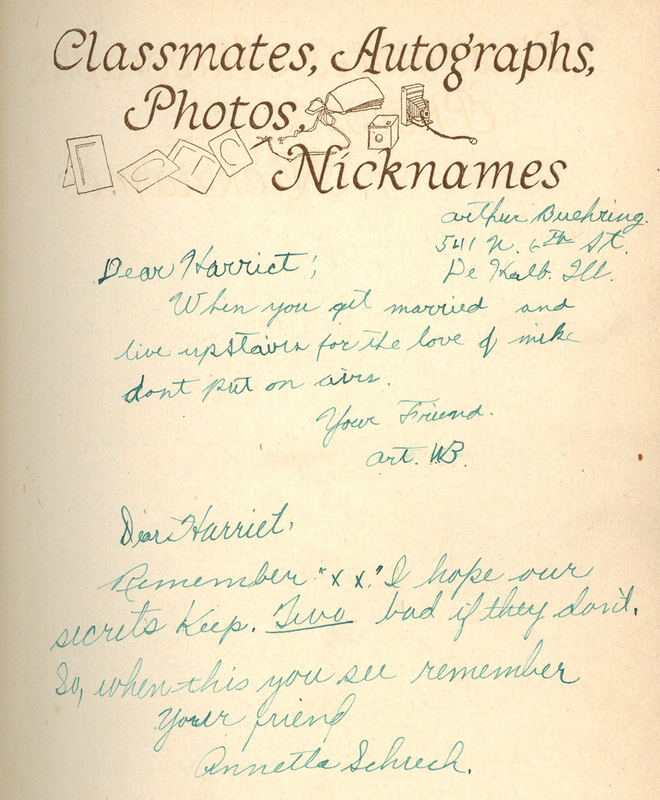 Soon after moving to San Diego in 1946 Harriet was invited to join Sankas, a group of eight women who got together every month. Sankas began as a bridge group, shifted to a sewing circle, and finally settled on having lunch together. Harriet attended her last meeting with Sankas less than a month ago. These close friends of 55 years have gathered for all the important times in each other’s lives. Three of the four remaining Sankas are here today. This was a woman who seemed to relish all phases of her life. She fondly remembered having candles on a Christmas tree, but was later thrilled to have her grandson help put up the strings of Christmas lights. She remembered when talking movies first began but was still enjoying the TV broadcast of the Oscars the night she died. As a young girl, she danced the Charleston but still felt the powerful beat of today’s music. She traveled cross-country in a Model A Ford, then by passenger train, and then by jet plane. When we began making rocket trips to the moon you could see a faraway look in her eyes. Harriet was a friend to many. She was a good neighbor well beyond the house next door. She loved her family unconditionally. She was compassionate and openhearted to all people, regardless of status. Harriet Lorraine Duncan Claycomb probably was “born lucky.” But those of us gathered here today know that we were lucky to have shared her time on earth. 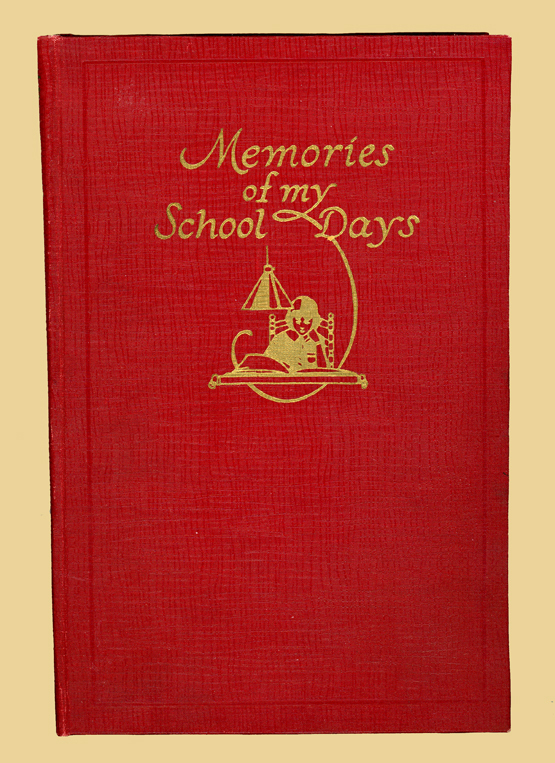 It covers 1927, 1928, and 1929 – the early years from her time at the Normal School and then from DeKalb High School. There are autographs from friends and from teachers. The teachers at the Normal School were trainees and quite young. 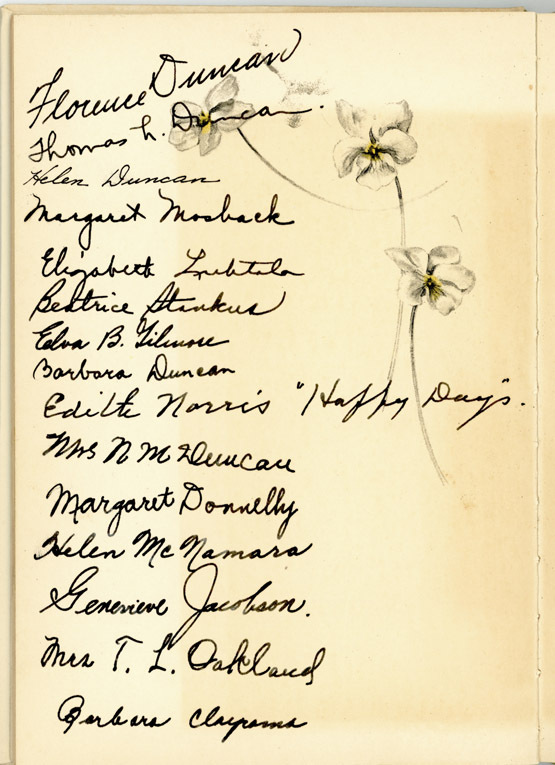 Here are some autographs from teachers and from her younger sister, Barbara. And then there are the fun verses of the time and mysterious references. And then the photos. Mom is ‘me’ bottom center and her sister Helen next to her. Mom wrote this story of her childhood. You can see Part 1 here. [This would have been in the late 1920s or early 1930s.] One day my Dad took me to the Boston Dry Goods Store and bought me “an ensemble.” I had never heard of such a thing but I always referred to that two piece knit dress and coat to match as MY ENSEMBLE. He even bought me some beige shoes with a one-inch heel to go with it — and silk stockings with seams up the back. When those stockings got a big run I asked him if I could have more. He said to charge them at Malone’s, so I did. That was a snap so anytime I wanted something I slid into the habit of charging it to my Dad at Malone’s. A few months later Grandma Duncan took me to task. 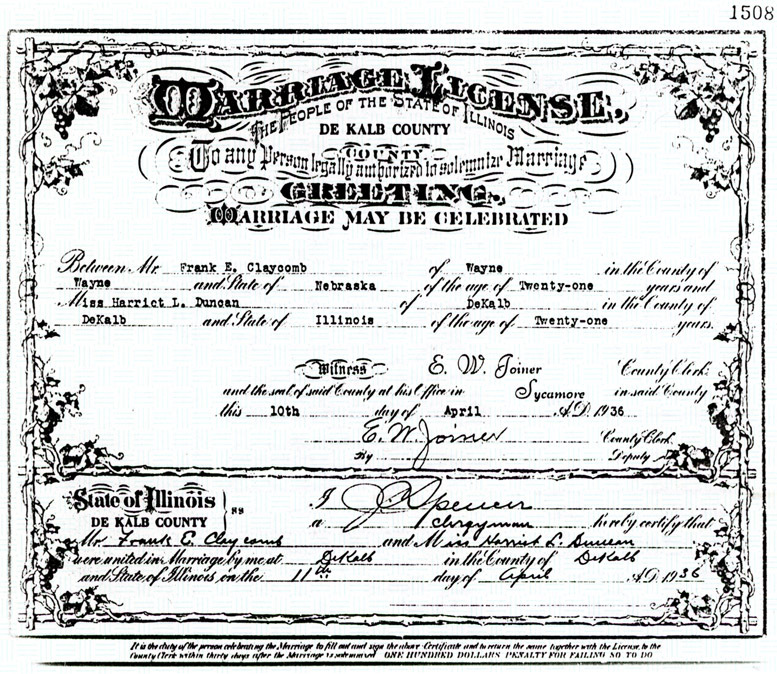 “You can’t go on doing that — these are hard times!” It sank in and I never charged again — until after I was married. Fran and I had many casual boyfriends and a few serious ones. From time to time we went with the same boys, often in groups, and usually doubledating. We’d walk to the movies, or go to the Cottage Cupboard for cherry cokes or chocolate cokes or a cheese or chocolate “toastie.” Those were grilled sandwiches. Later when the boys had cars we would just ride around and sing and joke. 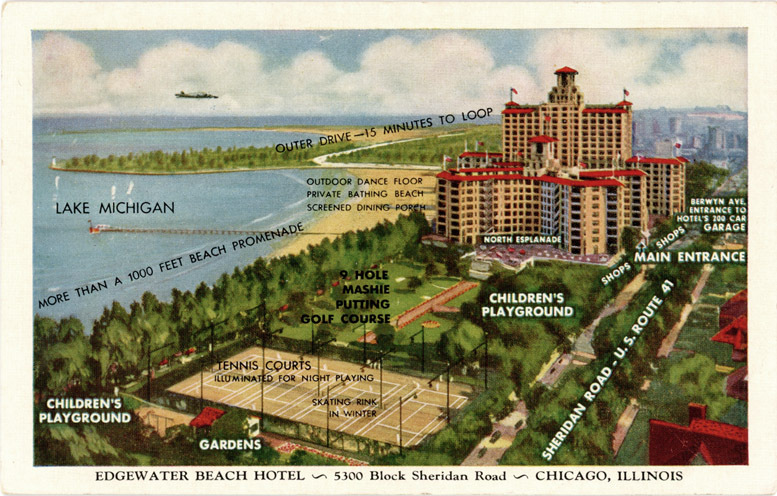 Later years we would pack a picnic and to go Starved Rock or a lake or Potawatomie Park in St. Charles. We swam a lot and Fran and I played golf at Sycamore — never got past the dubbing stage. Some days Fran and I would spend sewing (she was better than I). We made dresses and teddies to match. The dresses were always the same pattern — simple waist and full skirt. We made them in polka dots with teddies to match and another set in red and white checks. Harriet Duncan & Frances Duffey. Best friends in matching outfits. 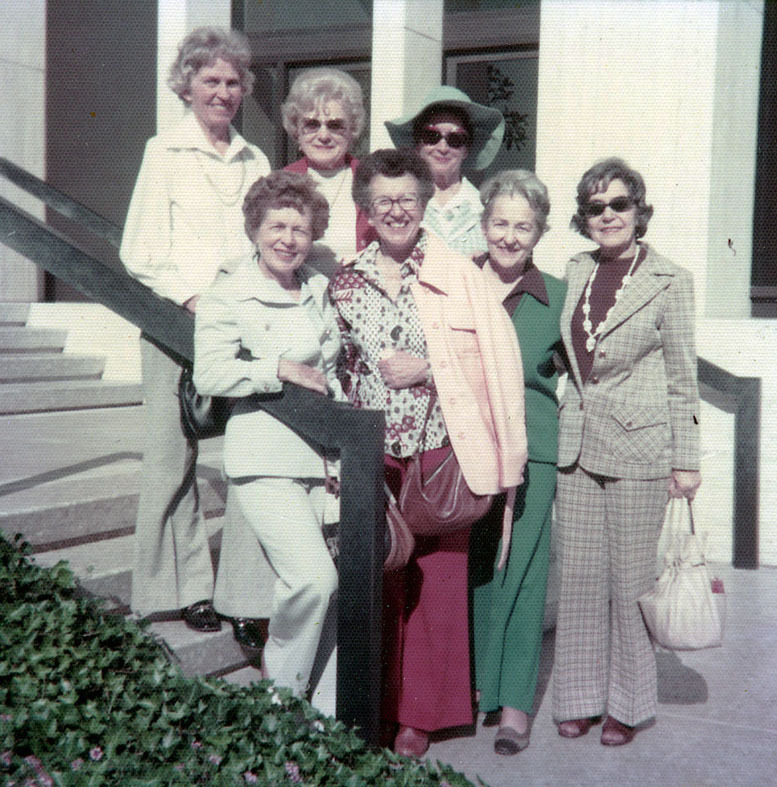 Our closest group included Eleanor Case, Helen Kientz, Margaret Donnelly and Helen McNamara. We had parties with just the six of us sometimes. When we could we would go to out-of-town football games together. One time on our way home from a Rochelle game we thought it would be fun to get the football players bus to stop — we were sure they would help us if we were parked beside the road with car trouble. We parked, put up the hood and the trunk and waited and waited in Helen Mac’s car. When we saw the bus coming we all stood out beside the care looking helpless. The guys all waved and went on by. What a blow! We got back in the car and it wouldn’t go — had a broken axle. It was hours before we got home. I was active in YWCA in high school and Fran more active in Dramatic Club; we both loved G.A.A. (Girls’ Athletic Association). There were many dances at school. After school were “Sunset Dances” where half of us stood around and talked waiting to be asked to dance. But other dances were at night and we always had dates for those and little dance programs with tiny pencils attached. Your date would line up dances and fill in the programs. But at the G.A.A. dance the girls asked the boys and we filled out the programs. There were Junior-Senior proms and Senior-Junior proms. In other words each year the Seniors would give a prom for the juniors and then the juniors would give a prom for the Seniors before they were graduated. There was also an annual Christmas Dance. My favorite prom dress was long and yellow, cut low in the back with a big lavender bow at the waist in back. Fran was in several plays. We were both in the Senior Play [they graduated in 1931] — I had a really good part but they told me they couldn’t hear me half way back in the auditorium. The auditorium was where we had assembly meetings — it had sloped seating as in a theater but the stage was our basketball court so it was huge, but of course draped for plays. Under that on the basement level was the girls gym with adjoining locker rooms and a big swimming pool. Fran and I would usually take two P.E. classes each semester, swimming and basketball were our favorites. Our basketball team played other school. Fran was better than I at most everything. Many of our classes were together but when she took soccer, I chose tennis. When she took sewing, I took economics. The dumb reason for that was I knew I wasn’t good at sewing and I didn’t want to show how little I knew. We both went to Glee Club tryouts and made it — not much competition. Helen had the voice in our family, a lovely alto. 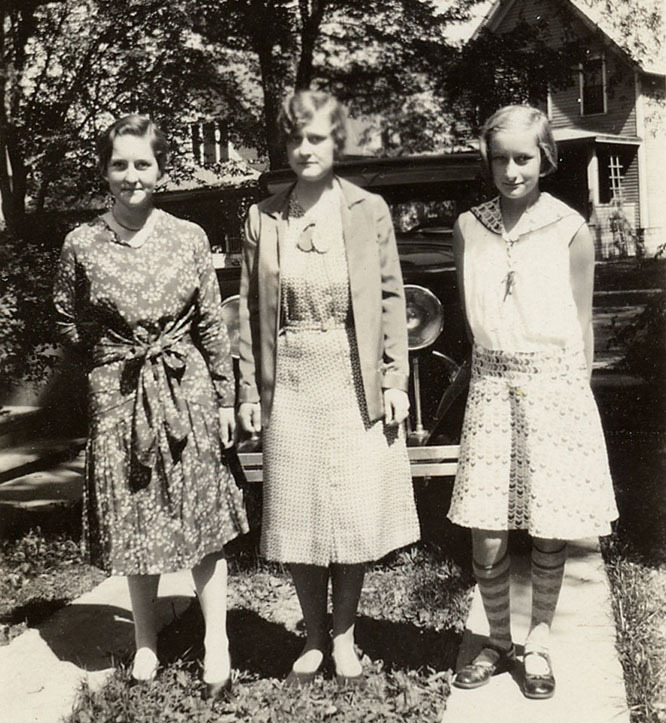 Harriet, Helen, and Barbara Duncan. Our town had money-making plays put on by out of town specialists but using local talent. We often got in the chorus and it was fun learning songs and dances. I think the community had great fun watching and laughing at the amateur shows. One family we saw for picnics and get-togethers were the Herricks. They owned Hey Brothers Ice Cream factory in DeKalb. for several years when we were young they lived upstairs over the factory. I loved to go into the factory. It was dank and fragrant, always wet underfoot. The huge vats of ice cream had spigots where the soft ice cream would gush and slide out into what bowl “Uncle” Glen held under it. The smells were of vanilla and fruit and dampness. It was a magic place. The original Hey Brothers Ice Cream was at Dixon. 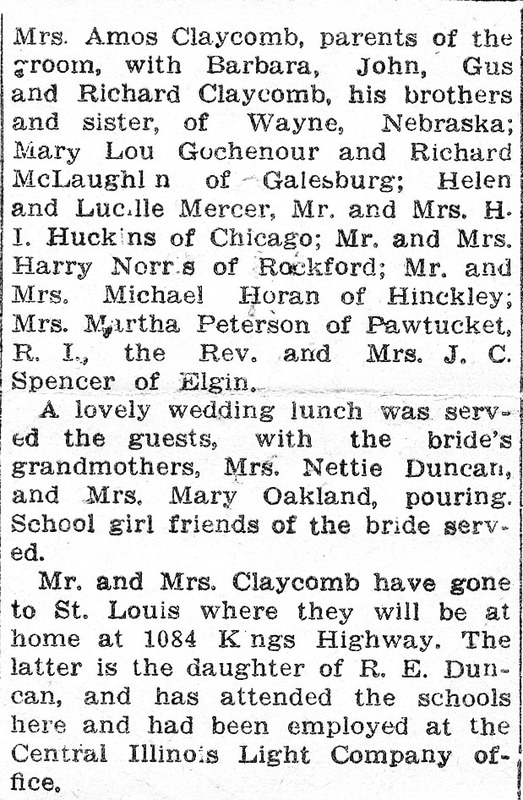 Their name was Hey and I guess Pauline Herrick was a Hey. Several families of us went to Heys and with them to Sinnissippi Park for a grand picnic. I guess I was about severn. When everyone was stuffed and the last watermelon gone, the group split and went in different cars back to Heys. They had a well at the Park where people kept the watermelons and lemonade cold and they had a drinking fountain of ice cold water from the well. On the way to the car I told Mama I was going to go back for one more drink. Well, they all went without me — families split up in different cars. I was dumbfounded when I came back to the parking lot and they had all left, but I knew they would come back from Dixon to get me. Well, nobody came so I walked up the winding entrance to the highway and from there to the nearest farm. I told the couple my plight and they said they had a telephone and I could use it. The phone had a crank on it to ring “Central” and I didn’t know how to use it. Finally the woman cranked it for me and I told Central who I wanted to talk to. The Heys and all my family were astounded that I wasn’t outside playing with the other kids. Mother and Dad came for me and felt as sorry for me as I did. One time at a church Christmas pageant a young girl dressed as Mary kneeled by the cradle and sang Ave Maria. I was swept away; it was so beautiful. On the way home I asked Mother what that song was. She told me but they were hesitant to accept this beautiful song because it was in Latin. I gathered that wasn’t suitable for a Methodist church. Uncle Oscar Oakland, Aunt Hannah and adopted daughter, Edna, live on a farm near Creston. Several summers I spend a week with them. 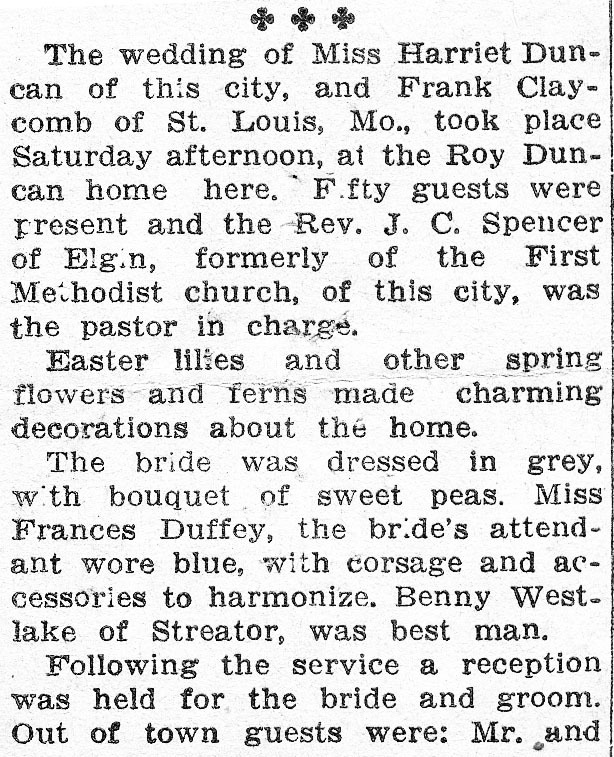 They had a player piano and lots of rolls. I would pump away and sing half the day. Sometimes I rode on the wagon with Uncle Oscar, a big, kindly man. One day when he was driving a manure spreader with a team of horses he had to stop at the field to open and close the gate. He let me drive the horse through while he took care of the gate. A special treat. Edna came to live at our house while she went to high school and two years of college. I never thought of it at the time, but no doubt the room and board money came in handy. We had so many good times as a family. The craftiest thing we did was make jewelry with candle wax. Mother bought it in many colors. She put down papers on the dining room table and lit kerosene lamps for us to heat the wax over. First we made beads, put a darning needle through them to string them, then we decorated each bead with pretty colored flowers. Mother was artistic and could crochet, knit and tat was well as do beautiful embroidery. We made sealing wax pins and “lavaliers” to hang around our necks. One night as we worked a lamp tipped over and Edna’s arm got terrible burned. She held it under the kitchen faucet, crying, until Dr. Rankin got there. After that we had other roomers who came from farms for high school or college — always one at a time. Orvilla Spencer, Ethel Oakland, Ellis Espe and Ray Wickness. They didn’t eat with us, just roomed. Uncle Ed Duncan, Aunt Florence and cousins Mary and Jeanne lived on Normal Road where it is campus now. The first time I ever tasted leg of lamb was at their house and I thought it was terrific. Uncle Ed used to referee at our high school and college games. Then he retired and sold athletic equipment. 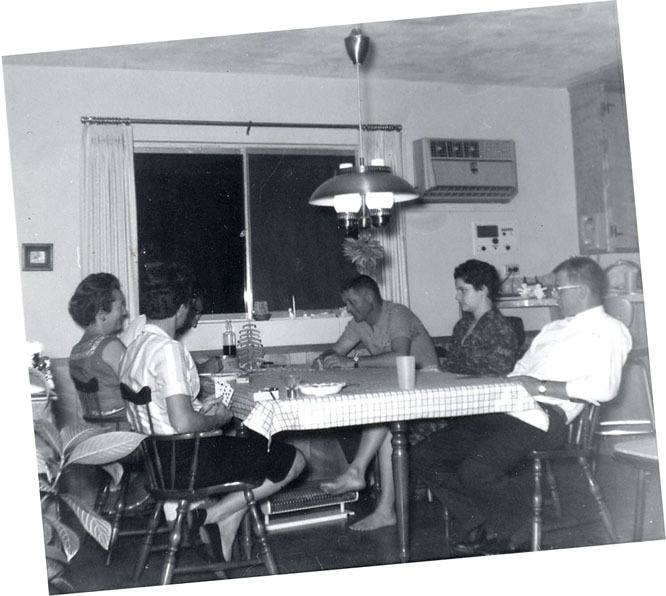 Uncle Milo Oakland, Aunt Hazel, Milo Jr. and Donn Eber lived on Augusta Avenue. He was Head of the Industrial Arts Department at the college. I babysat for the boys now and then. Every year there were Oakland family reunions and sometimes Sanderson reunions. I got to know some of the Oakland cousins fairly well, but there were aunts and uncles I couldn’t remember year to year. Oakland Reunion. Harriet, Helen, Barb: center front children. My mother about 1936 when she married my father. We had this vanity until sometime in the 1960s. 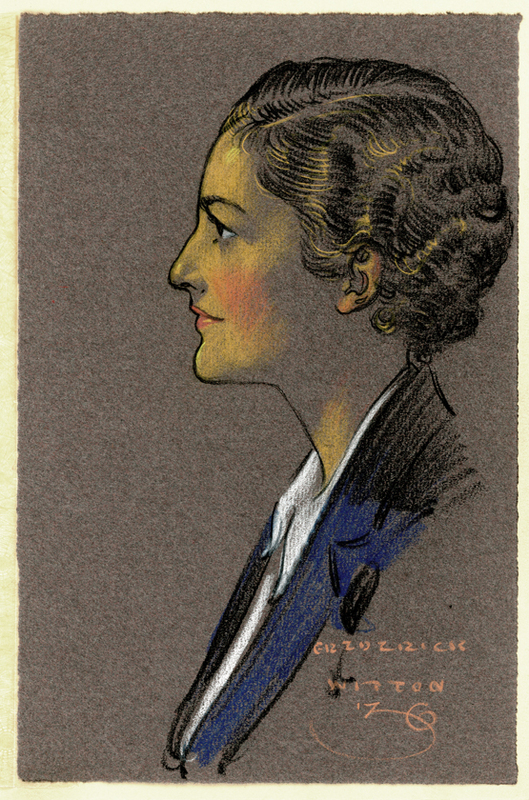 Drawn by Frederick Witton, 1936. I’ve never heard the story of this portrait although Witton is fairly well known.